John you are right on specific tech. But ZZ can offer you something else. Because you don’t do ZZ it’s hard to explain. Because during ZZ, you are nourishing you Yi. The Yi is like how much clay you have. And clay for you to mold into any shape desired. And with practice, you start to understand how others think when they move. Then you understand how they move. And then you can literally copy their move. Usually it takes years to master certain moves in MA, but for you with some foundation in CMA, you can progress in any area in a very short period. I mean like few months as compare to years. Hey, Buddha is said to have sat under the Bodhi tree for only 49 days before he achieved enlightenment. Maybe sitting is even better than standing? Steve James wrote: Hey, Buddha is said to have sat under the Bodhi tree for only 49 days before he achieved enlightenment. Maybe sitting is even better than standing? If your sacrum channel is open and can do lotus sit, why not, do as long as you can. But because all is blood is blocked on legs and push toward the head, so unless your focus will be less on vitality but more on the mind cultivation, this is not exactly what you want in kungfu. But who is to say no. If you have not open sacrum channel and do lotus sit without warm up, you are in for a injury. Overlord wrote: Because you don’t do ZZ it’s hard to explain. I do ZZ. I just don't hug tree. Last edited by johnwang on Mon Dec 10, 2018 12:43 am, edited 2 times in total. Hmm...John we are not on same page. Maybe it was not either sitting or standing, but the Bodhi tree. It was the apple tree for Newton. Overlord wrote: Guo Yunsheng was reknowned for his Beng. Yes, but it was not sufficient since he was beaten by a Xingyi practitioner who had mastered all of the elements. No I don’t think this story is true at all. Thanks Strange, for years I really don’t get the nature of this story. 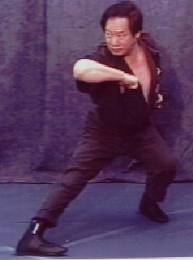 Guo had learn Baji and Monkey fist before Xingyi, so his moves is reknown as fast and agile. His Beng according to my teacher is zig zag and not straight line. Secondly, one of Li Cunyi and Guo student went to exchange skills with Shanxi branch, and they found his attack is unstoppable by Shanxi branch. This exchange is of course friendly indoor exchange of skills. So my teacher concluded that because Hebei infused bit of Baji power, so it’s hard to stop if not life and death explosive power used. I really doubt Guo is that venerable and weak as compare to his kungfu senior. Plus I found chicken Beng is so versatile. But needs bit of courage to test under pressure. It might have been reasonable a few hundred years ago. Like dying at 40 or something. Last edited by cloudz on Tue Dec 11, 2018 8:41 am, edited 2 times in total. my belief is that Guo's main aim was to make Che "reveal" his skill, it was not a fight with "outsiders"
when testing skill with kungfu brother, you have to consider 情.
so i do not think Guo use killing intention in his attack. Thanks for sharing, Guo's zig-zag beng step. personally, this is the first time i heard about this. if true, it is a very cunning and cheating move. secondly, it can give you that little bit more angular waist torquing action to put more power into your beng. Last edited by Strange on Tue Dec 11, 2018 5:13 pm, edited 1 time in total. Surprised to read this, that you guys haven’t come up with or have not yet been “freed”to understand after yours long time molding Xin/Xingyiquan into your bodies and mind you can go straight, zig-zag and turn as you want, you can go free styling.